Identifying and analyzing data for haul road optimization, directly impacting the bottom line. On-going haul road optimization efforts are necessary for improved operational efficiency at a mine site. Road quality, a big concern associated with haul roads, requires constant watchfulness due the daily wear and tear from heavy machinery and rough weather conditions, leaving roads prone to defects. Each stage of the process, from design to loading and transit through haul road networks, has deep implications on operational expense and efficiency. Insufficient or inadequate vigilance over the design and maintenance of haul roads may have detrimental consequences, negatively impacting productivity, costs and safety. Additionally, solving maintenance issues bears excessive costs as well as countless hours that could otherwise be preventable. For informed decision-making, mining engineers rely empirically on local experience and evidence. Critical decisions, which influence operational processes, are achieved by relying heavily on inefficient and outdated ground-based data collection methods. However, the process of transporting material from the blast area presents many opportunities for improvement in surface mining operations. Drones can complement traditional data-collection techniques. Capable of covering wide areas more accurately and efficiently, drones have emerged as a tried and true method, equipping mining professionals with a versatile data-harvesting tool. Regardless of mining environment, or mission-type, drones are not susceptible to fatigue or complacency, and serve as a valuable industrial multi-tool to aid in the planning, inspection, analysis and maintenance of haul roads. Airobotics automated drone system offers mining professionals access to a limitless aerial perspective, through scheduled and on demand missions, while eliminating logistics involved in drone operations. The key to generating substantial change in haul road optimization lies in automation. Automated drones can assist with haul road design through high quality imagery and videos to be processed into digital 3D models, which assist and guide mining professionals with the planning and construction of roads. Automated drones can also assist with slope inspection, by calculating vertical and horizontal slopes of haul roads, thus preventing temporary stoppage of haulage trucks leading to enhanced productivity. Additionally, integrating automated drones into haul road inspection practices serves as a safer alternative to manned inspection of dangerous and damaged areas, lowering risks of accidents and injury to personnel as well as daily routine inspections. Drone-sourced data can then be analyzed, shared and logged digitally for real-time and future reference by mining professionals. 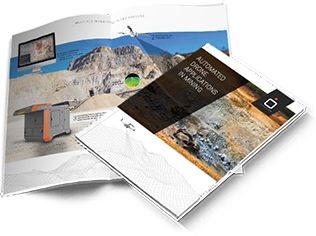 Mining professionals can rely on drone data, to monitor road width at multiple locations, by digitally measuring the ground distance between opposite road edges. Other uses for automated drones include measuring side barriers to identify areas that require maintenance and water drainage simulations to simulate flow and accumulation of water.